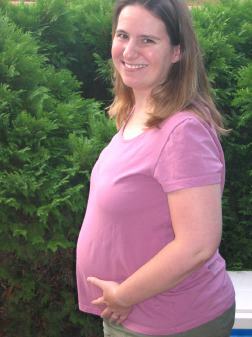 Despite not being a big fan of having pictures taken of myself, here is a picture of pregnant me. Some days I feel huge, while on other I feel fine. I haven’t done too bad with my weight so far. I actually only gained 4-5 pounds during the first 17 weeks of the pregnancy. I then went and gained an additional 7-8 pounds by 21 weeks. The doctor was not too concerned due to the fact that it all appeared to be in my belly. I started out my pregnancy hypervigilant about not eating too much. I think over the last six weeks I have gotten a bit lax in that area and just need to tighten up and increase my exercise a bit while I still can. 23 weeks down, 17 to go! You look great, Leslie. Healthy and Happy! Thank you so much for the picture Leslie – you look gorgeous! Leslie you look fantastic – so happy and joyful. It’s lovely to see a pic of you and baby x. You look wonderful (and so does the baby)! You (and baby!) look wonderful! You’re so cute! And you look so happy! Great picture! You are defintely glowing. You look great, I love baby bellies.